Hurricane season is here. In the Atlantic region, meteorologists say hurricane season lasts from June 1 to November 30. That’s six months of possible damage to your home from strong winds, fierce rain, power outages, and more. Typically, homeowners will receive a hurricane warning 48 hours before the storm hits. Instead of waiting for a storm and dealing with the consequences later, here are a few ways you can prepare your home for a storm. Roof. Is your roof missing any shingles? Siding. Does any siding look damaged or loose? Gutters. Are your gutters clean and attached to your house? Windows. Do you need storm shutters to protect your windows? Doors. Are your exterior doors secured? Is your garage door fully functional? If any of these areas have problems, get them checked out or replaced as soon as possible, that way your house is better insulated from a storm. Additionally, make sure your outdoor furniture is secured or can be moved indoors easily. If a bad storm hits, you could lose power for several days at a time. Instead of quickly assembling a hurricane survival kit after a storm warning breaks, it is much safer to create one now. Even if you live in a large city, a natural disaster can leave you without easy access to food and water. 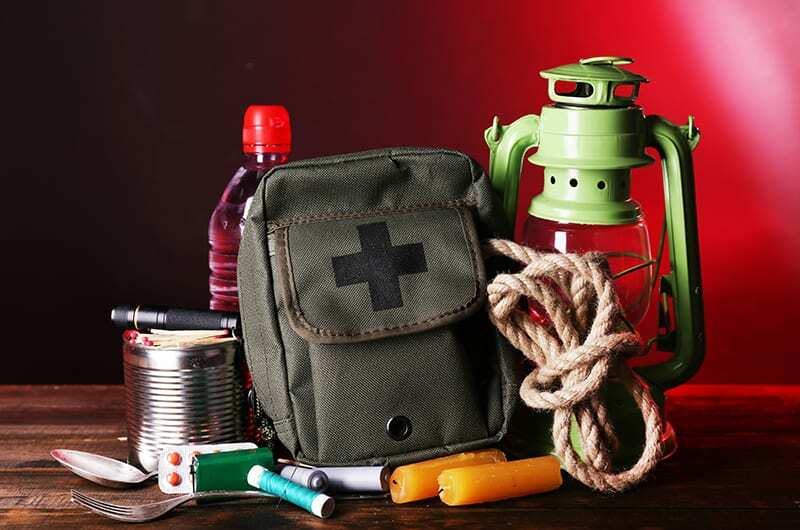 So make sure that your hurricane survival kit contains at least three days of non-perishable items, including one gallon of water per person (and animal), per day. If you have a baby, be sure to include formula, diapers, bottles, and powdered milk. Adults may need heart and high blood pressure medications, insulin, dentures, contact lenses, menstrual supplies, and so on. In addition to packing whatever specific medications individuals in your family require, be sure to have non-essential medications like aspirin, laxatives, and antacids. Be sure to have flashlights, lamps, and plenty of batteries on hand. 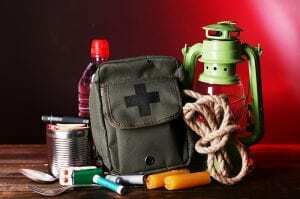 Candles, flares, lighters and waterproof matches are also great items to have during a storm. Additionally, make sure personal documents like your passport, license, and insurance policies are safe and secure. It’s never too early to begin building a hurricane survival kit. Perishable items like food, water, and some medicines should be replaced every six months. You can build the kit yourself, or buy a pre-made kit online. If your home needs to be more secure for hurricane season, DryHome can quickly repair your roof, siding, windows and doors. Contact us for a free estimate today. We’re here to help you prepare for the unthinkable.